Are you looking for something fun and exciting that can either save you money? Then it’s time to get your hands on with one of the FREE Home Depot home improvement workshops. They have various FREE workshops for do-it-yourselfers of all ages and experience levels. Depending where you live, they have different workshops for you to choose from. Take a look at their upcoming workshop calendar and enter your zip code (or city and state) then choose the best workshop for you to partake in that is in your local area. 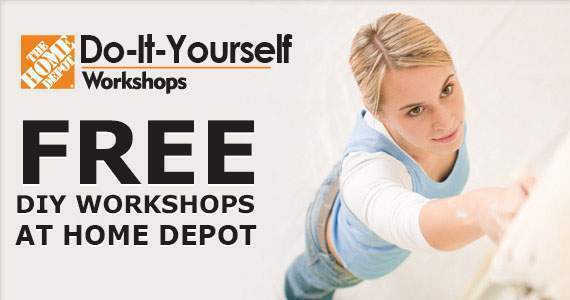 Weekend Workshops: Come Improve DIY Skills at The Home Depot! Score the skills you need to properly install a tile backsplash. There are plenty more workshops for men, women and also for children between the ages of 5 to 12. You just have to check out the Home Depot workshop calendar to see what is in your area at the time and select from the workshop that best fits your interest level. Enter your zip code to confirm which is the closest participating Home Depot store available to you. Then register for it which will take you no more than sixty seconds. This sounds like a fun project that can help you save money on home repairs. Thinking it might even helpy you a few extra dollars with your new knowledge and helping your neighbor or friend out. Consumers Be Aware: Stores Are Now Allowed to Add Credit Card Surcharges!